Anthony Kiedis is an American singer-songwriter, best known as the vocalist/lyricist of the band Red Hot Chili Peppers. He and bassist Flea are the only members of the group to have appeared on all of the band’s studio albums. Kiedis is also an occasional actor, having appeared in F.I.S.T, Point Break, and The Chase. In 2004 he published an autobiography, entitled Scar Tissue. Kiedis spent his youth in Grand Rapids, Michigan with his mother before moving, shortly before his twelfth birthday, to Hollywood to live with his father. 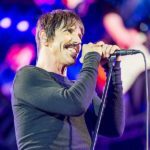 While attending Fairfax High School, Kiedis developed close friendships with fellow students Flea and Hillel Slovak, who at the time were members of a band called Anthym. After high school, Kiedis began taking classes at UCLA, but dropped out during the beginning of his sophomore year. "The fact my relationship with my son is so good makes me forgiving of my father and also appreciative." "I know my dad is a big Internet freak, and he’s been known to be a Wikileaker." "As a father now, I wouldn’t do what my dad did, because it left me feeling emotionally unstable as a kid. But he didn’t do the things he did out of selfishness or malice." "I would have to say the person with whom I am most in love is definitely my son, Everly Bear. Although I’m his dad, I’m also his friend."